With the regular season winding down to a close, another harrowing re-Doop decision behind me, and a playoff game on the horizon, I’m in Union fan over-analysis mode. How should I grade this season? What’s the minimum “acceptable” playoff outcome? What are the key upgrades I’d want to see this offseason? Did I make the right renewal decision? While the regular season finale at NYCFC could alter this assessment (a third place finish and home playoff game would easily beat any preseason expectations I had), this season scores as a ‘B’ grade today. 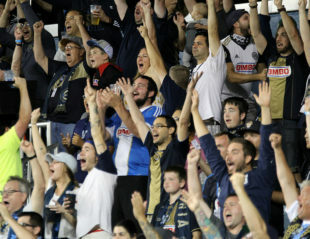 The Union have already secured the best record of their nine year existence, continue to play entertaining soccer, and can point to strong campaigns from key young talent (Trusty, McKenzie, Rosenberry, and Picault) that bodes well for the future. On the other hand, entertaining soccer hasn’t translated to enough goal scoring, the team lacked the offensive depth to overcome poor seasons from key offensive players, and head coach Jim Curtin has few buttons to push when impact subs are needed to chase a game in the second half. The Union have vastly improved, but the goalposts have moved with a few top tier teams really separating themselves from the pack this season. The disconnect for me as a fan is that despite feeling a sense of accomplishment and hope stemming from a Union-record 2018 campaign, there’s also a familiar sense of gloom that the Union may end up with an uphill battle in the form of a knock out game on the road or in the form of any matchup against a red hot D.C. United team. I’m thrilled that the Union locked down a playoff spot, and even more excited that we’re not sliding in on the last day of the season. But what do we need to see in order to call the overall 2018 campaign a success? Given our record and relative run of form playing possession based soccer, I feel like another first round exit would be a very disappointing outcome. A first round loss at home would be incredibly disappointing. Side note: As a father of two elementary school age children, if anyone has any sway with MLS and can make sure we don’t end up with a home playoff game on Halloween night, please work your magic. Having taken a clear step forward this season, and with a new Sporting Director in town, the stage is set for an intriguing off-season. How do the Union make the leap from good team to being a legitimate threat to bring home the MLS Cup? Clearly, goalkeeping is a strength. It seems safe to say that 75% of the backline is set for the foreseeable future, including a back-up center back that we can feel confident starting any given day. The midfield trio was a clear strength this year. While being a bit light on defensive bite, they were strong in passing, creativity, possession, and veteran savvy. A youth infusion here would be beneficial, but I think that comes in the form of rotating Derrick Jones and Anthony Fontana through to help keep the big three a bit more rested in 2019. Striker and the wing positions were nothing short of a mixed bag in 2018. While Picault seems to have cemented his place in the 11, and Ilsinho continues to dazzle and entertain in smaller doses, I wouldn’t be surprised to see a good deal of change across the attacking group. Cory Burke has been a revelation, but defenses seem to have clamped down on him of late, and his ceiling looks to be as a back-up striker for a team looking to seriously compete for trophies. Keep Borek. Borek Dockal makes a difference and is fun to watch. And is there anyone out there who can stomach another no. 10 search if the Union can’t find a way to retain his services? A difference making striker. It would be incredibly short sighted to go into next season counting on Sapong to rebound and Burke to perform like a number one striker option over the long haul. A new starting LB. I enjoyed the Fabinho era, pre and post sun rocket planning. I admire Ray Gaddis and what he’s given this team. The former doesn’t seem to be in the future plans, and the latter should revert back to being a defense-first backup option for both outside back spots. The new starter very well could be Matt Real, but if he’s not ready, I want to see someone here with a left foot and the skills to boost our attack down the left side. Starting right wing. It really has been fun to watch this team move the ball and retain possession in a way that infrequently happened during the first eight seasons. But this team clearly needs more impactful attacking options, to put pressure on defenses in the final third. Maybe David Accam comes back healthy and with a chip on his shoulder next year, but I would like to see at least one legitimate starting quality option added here. Midfield rotation. Returning the current midfield trio keeps us competitive, but given their aging legs and the Union’s model to build through the academy program, it’s imperative that young midfielders like Jones and Fontana get rotated through to keep the starters fresh. I’m back for season 10, but I moved to a slightly less expensive section and dropped one seat. I feel good about my decision. Logistically, it’s become more challenging for my family and myself to attend games, which made me question the overall expense more than I had in the past. That said, there was an emotional element to the decision. My son and I have gone to Union games together since he was 18 months old, and we still very much look forward to it now. There’s also a feeling of being part of something bigger that I’m not sure you get buying single game tickets off of Stub Hub. And I simply enjoy the game day experience. In light of everything I just wrote about, it’s just not something I’m willing to give up. The biggest disappointment for me is the money they spend in 2018 on Simpson and Sapong. Hope they can get rid of both in 2019 and can buy just one striker for the money they currently spend on those 2 underperforming strikers. Looking also forward to what the new sporting director will do. Based on what Tanner said during the last town hall meeting and what he has done at Hoffenheim I have a lot of faith in him. I decided to keep both seats near the beer deck. Over the years as my kids went to College I went down from 4 to 2 seats. If the soccer in 2019 will be bad then at least I can sip good beer on the beer deck and watch some nice boats on the river. I’m back for year 10 as well. I said a few years back when ES was hired, I would give this team until the end of year 10 to see where they are and decide if it’s worth future investment. Another positive season like this one and I think I’ll be sticking around for a while. I really hope this is the beginning of a nice run of seasons for the Union and not a one off. Lord knows we deserve it. Great read Scott! I’m not as tactically knowledgeable as I would like to be but have always questioned why the youth don’t get mixed in more to keep other guys fresh. Striker is #1 for me. And anything else is gravy!! Thanks! They definitely need more guys who can finish – ideally a striker and another wing player opposite Picault with a little more scoring punch than current options. Curtin clearly didn’t have an issue playing young guys in the back, but did seem hesitant in midfield. I’m not sure if that’s not being fully confident in jones and Fontana, or a function of thinking you’ve got savvy veterans in those midfield slots who know how to play through fatigue, minor knocks, slumps etc. I just feel like we could’ve saved a few more miles than we did on those 3 mids this season. A minor quibble: Picault is 27; not exactly “youth” though certainly not over-the-hill either. I chose to renew for next season, but it was a tough choice. My daughter – the impetus for me to attend that first-ever home game at the Linc, which directly lead to me getting season tickets – is off to college next year. No idea where at the moment, so no idea if she’ll be around for the games. But regardless of where she goes, college sure as hell ain’t cheap. And money’s been on the tight side in general lately. So like I lot of things, the expense of tickets – and everything around it – was something we examined closely in our budget. In the end, a large part of my decision basically came down to the fact that the Union (in my opinion) held up their end of the bargain. They improved, both in the table and in their style. So, I’m back next year – even if I currently don’t know who will be sitting next to me on a regular basis. I can fully relate to the budget/logistic considerations. I didn’t think I’d be back for those exact reasons, but couldn’t cut the cord. Good call on Picault. He’s really in his prime I guess, not so young. I guess I still think of him as young, since he’s still pretty new to the scene, the recent call up to USMNT with a lot of younger players, etc. Whether Ernst Tanner would take as long to find a number 10 we don’t know. Like everyone else I like to bring Dockal back. His loan is said on Wikipedia to expire December 31st, 2018. Whether that is surmise or fact is unclear. He is two managers removed from the one who brought him into the club. The most recent man is Chinese and has been on the job since September 27. His predecessor began about a half a year before that. His club, Henan Jianye FC, currently Is listed on the CSL website as tied for 14th of 16. The first tiebreaker according to Wikipedia is head-to-head points. As I have no Chinese I have no idea how they did in that grr, o whether they still have a match to play with tir fellow #14. The bottom two will be relegated. It would seem logical that an expensive foreigner might be expendable in a relegation retrenchment. But, a quick look at two China League One rosters suggests that foreigners do play in it, so they could have him return even if they are relegated. Business would seem to suggest that Henan Jianye would want to recover as much of their initial investment as possible. So the issue might be how much the Union and MLS are willing to pay to acquire him. The stronger the Union finish the more credible paying fees to acquire him would be with the league, it seems to me. Henan Jianye won last Sunday 2-0, lifting itself into the tie for 14th with Chongqing Lifan who drew 4-4. We need to be rooting for the Chonqing club to keep 14th all to itself. ESPN seems to record that Chongqing Lifan have beaten Henan Jianye both times this season. If that is true, I think I know head-to-Head is the first tiebreaker in the Chinese Super League table, so Henan Jianye must surpass on points not tie, if they are to avoid relegation. They have four games left, as nearly as I can tell.